Lilac Bouquet – Guest Post!! Hello! After a long absence due to my lack of camera charger (tres frustrating), I’m back with a review of Lynnderella’s Nosegay from her most recent collection, Lovely Is As Lovely Does. 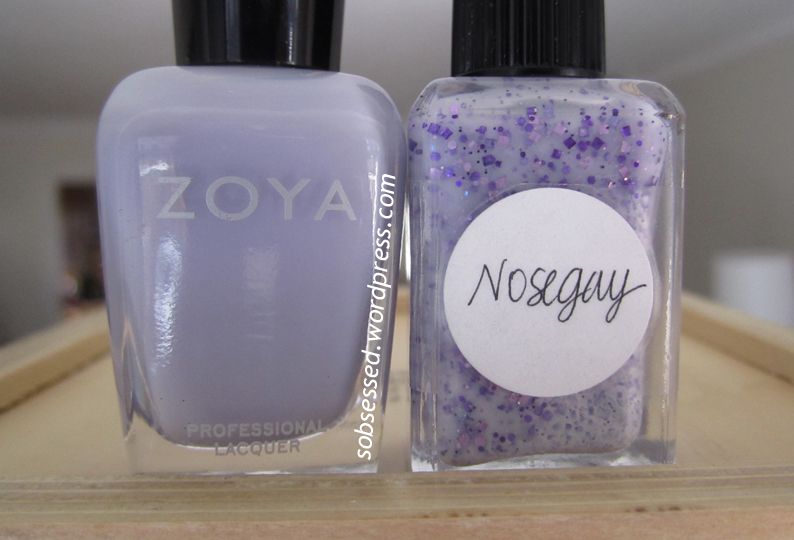 Nosegay is a delicate lilac-coloured base polish with medium purple glitter in a variety of small shapes: square, hex, circular and some micro glitter. All glitter is the same shade of purple and this really appealed to me, along with the fact that I’m apparently purple-obsessed. As soon as Nosegay arrived in the mail from Llarowe, I knew I had the perfect base: Zoya’s Miley which is my current favourite polish. Miley is a gorgeous pale purple-grey JELLY!! Its application is a breeze for a newbie like me, and it dries to the most perfect sheer jelly finish. As you can see in this side bottle shot of Nosegay, the bottle I got wasn’t mixed very well. There was a lot of white at the base and the purple was sort of suspended at the top. I did a lot of vigorous shaking to help blend the two colours, but even after all of that the two colours have yet to perfectly mix together. 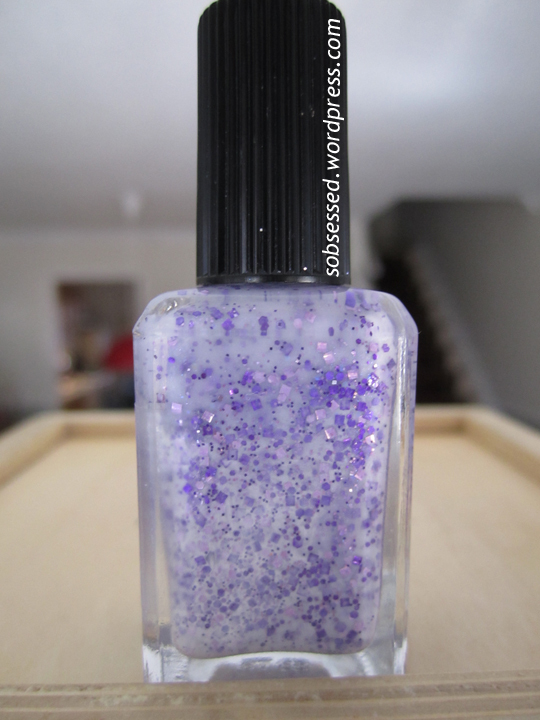 I found with this Lynnderella that the glitter was very well distributed throughout the bottle, even though the colour distribution was poor. I didn’t have pooling of glitter at the bottom like I did with Gotta Love Brains (see review here). Here I have on an OPI basecoat, 3 thin coats of Zoya Miley, one coat of Nosegay (with a bit of spot-glittering with the brush) and one coat of Essie Good to Go topcoat. Even with all of these layers on, my overall manicure doesn’t feel thick like it does when I wear cream polishes, I think that’s one reason I love jelly polishes so much. Miley does build to a nice opacity with 3 coats but it isn’t 100% opaque. What do you think? Are you a fan of the jelly and glitter look? Have you worn Nosegay with another base? Oh gosh! This is to die for! What a pretty look! I wish I owned Nosegay. I am definitely a fan of the jelly and glitter look! Haha, me too!! I don’t have it yet though Mai makes it look adorable!! Hmm, I wonder how Nosegay would look as a jelly-sandwich! !